Health visitors play a crucial role in helping families ensure that their children can thrive throughout the early years and beyond. 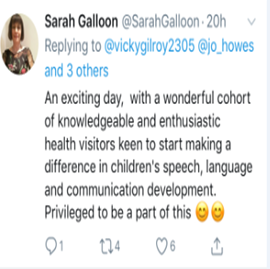 Here we set out PHE’s work to support health visitors to make an even greater difference to the lives of children with speech, language and communication needs. Every child deserves the best start in life and, to help this happen, there continues to be a cross-government focus on the early years and the importance of sound foundations. Children with poor vocabulary skills at aged 5 are twice as likely to be unemployed when they reach adulthood. 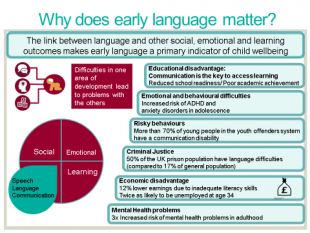 Early language acquisition is key to every child’s healthy development and sets the foundations for achieving and learning throughout life. Health Visitors play a vital role in closing the word gap and promoting healthy speech, language and communication in children from birth to age 5, as set out in the High Impact Areas. Parents are the experts in their child’s health and wellbeing. Health visitors work with parents to promote children’s development, assessing needs and identifying problems or issues at the earliest opportunity. 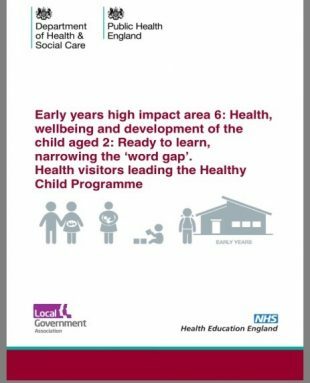 As the lead for the Healthy Child Programme (0-5) and thanks to their enduring relationships with families, health visitors have a crucial role to play in supporting parents and identifying Speech, Language and Communication Needs early on. There is a clear opportunity for us to help more children develop the skills they need to reach their full potential. That’s why Public Health England is working with the Department for Education and other partners to deliver a cross-government ambition to halve the number of children not achieving their expected level of development at the end of their reception year by 2028. This is outlined in Unlocking Talent: Fulfilling Potential. Health visitors are key to achieving this ambition, which is why we are leading an ambitious programme of work to equip 1000 health visitors with further skills to help them identify SCLNs early on. This will support improved signposting and referrals to Speech and Language therapists, to help children get the right support when they need it. We have commissioned the Institute of Health Visiting to develop and deliver this training, working in conjunction with partners and specialists to do so, including academics and researchers. The training began this week in the north of England, PHE and iHV welcomed the first two cohorts of health visitors from the 46 Local authorities who have been selected to be part of the initial pilot. Health visitors who attended shared their enthusiasm and positivity on social media! Over the next two months, 400 health visitors will attend the one-day ‘train the trainer’ events and they will cascade this training locally across their teams. The training will include sharing evidence and best-practice, developing enhanced awareness of early language acquisition and local referral pathways. 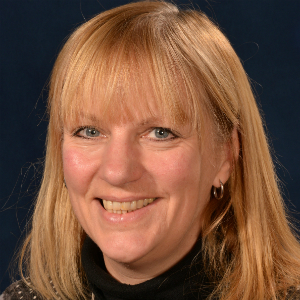 A further phase of training will then be undertaken with health visitors before it is made more widely available to the wider early years workforce. 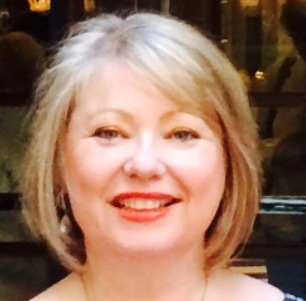 To support the roll out of the training will establish a support network; this will provide an opportunity for health visitors and Speech and Language therapists to come together to share local good practice and to strengthen referrals and pathways. An early language assessment tool to help identify children that may benefit from additional support. Other work that we are currently involved with in partnership with the DfE includes an exciting project with the National Literacy trust to create innovative new ways to promote the importance of speech, language and communication development to parents and communities. These exciting programmes of work with health visitors and the wider early years sector have the potential to make a lasting difference to the lives of thousands of children and we look forward to keeping you updated on our progress.